To create desktop shortcut for Windows 8, 8.1 or Windows 7 / 10 onscreen keyboard! 1.) ... Create desktop shortcut for osk on all Windows! 2.) ... How to put a shortcut on the desktop for all users windows 8.1 / 7 / 10? See also: ► Problems with fonts on Windows 8.1! 1.) Create desktop shortcut for osk on all Windows! Please use the Windows 8, 8.1 key combination [Win-Logo] + [D] to see the Windows desktop. and enter the Name for the shortcut, for example osk! Tip: Use Windows key shortcut [Win-Logo] + [U] to open "Ease of Access Center"
You can use this procedure for all other system programs, folders and Internet addresses! The difference is that the location and your selected link name changes! (Image-1) Create Windows 8 onscreen keyboard desktop shortcut! There are a few different kinds of keyboards. The most common is a physical, external keyboard that you plug into your PC. A PC with a touchscreen also has a touch keyboard. When you’re using a Windows 8 or Windows RT PC with a touchscreen, tap in a text field or other area where you can type and the touch keyboard appears. Windows 8.1 an Win 8 also has On-Screen Keyboard (OSK), an Ease of Access tool. You can use OSK instead of relying on the physical keyboard to type and enter data. You don’t need a touchscreen to use On-Screen Keyboard. OSK displays a visual keyboard with all the standard keys. You can select keys using the mouse or another pointing device, or you can use a physical single key or group of keys to cycle through the keys on the screen. 2.) How to put a shortcut on the desktop for all users windows 8.1 / 7 / 10? The second Desktop folder in Windows is shell:common desktop is responsible for all users, when here, an entry is created, or deleted, this is valid for all users on the Windows PC. Here is the alternative addresses, this can you use to create a new Windows 8.1 / 10 and others desktop shortcut. 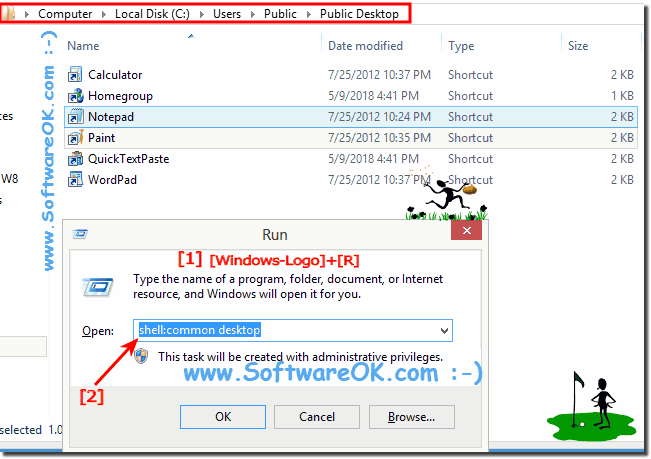 Create a shortcut for all user on desktop in %Public%\Desktop! (Image-2) All user desktop shortcut for the Windows 8.1 / 10! Windows-8 - FAQ-81: How to create a desktop shortcut for the Windows 8, 8.1 / 10 onscreen keyboard? Scan desktop for shortcut key? Creating desktop short cut on windows 8.1? Create desktopshortcut of website on windows 8.1 touch screen desktop? Why is the desktop shortcut different from the desktop folder in windows 8.1? Creating a desk top shortcut on window 8.1? Create shortcut on windows 8 rt? Windows 8.1 how to create desktop shortcut? How to install an icon on the desktop using windows 8.1? Windows 8.1key bord short kut key pdf file? How to create desktop shortcut win 8.1? Windows 8 real keyboard shortcuts? How to create shortcut on desktop 8.1? Can i create a shortcut for desktop in windows 8? Hotkey for onscreen keyboard, vista? How to create shortcut to desktop windows 8.1? How to create short cut for on screen keyboard Windows 8 desktop? How to create shortcuts in windows 8.1 on the desktop screen? Windows 8 shortcut for onscreen keyboard? Windows 8.1 Create Desktop Shortcut? How to create a shortcut for onscreen keyboard windows 8 on screen? Create a shortcut for my computer in windows 8.1? How to put a command in a shortcut usign windows 8.1? How to create a desktop shortcut windows 8.1? Make short cut on desktop for windows 8.1? How to create a short cut to a web site in windows 8.1? Create shortcut windows 8.1 desktop? Windows 8.1 how to create shortcut on desktop? Create desktop shortcut in windows 8.1 touch screen? Windows 8.1 how can i show only the enter key in on screen keyboard? How to Create Windows 8 onscreen keyboard desktop shortcut? How to create shortcuts in windows 8 for all users? Windows 8.1 create shortcut on desktop? Creating a desktop shortcut for the Windows 8.1 on screen keyboard? How to create a desktop shortcut in windows 8 rt? Desktop shortcut in metro windows 8.1? How to create desktop shortcut in windows 8.1? Win 8.1 how to make short cut? 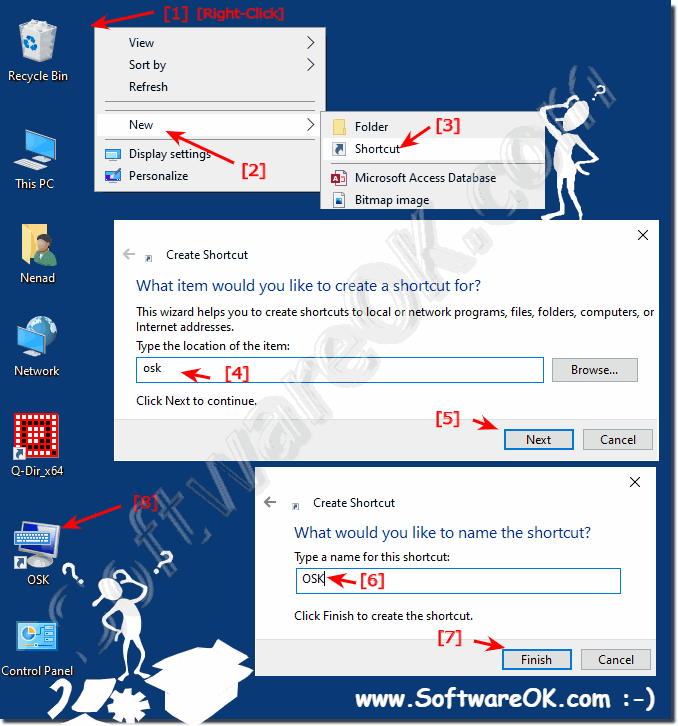 Windows 8.1 how to create desktop shortcut for all users? Create shortcut in win 8.1? Windows 8.1 keyboard shortcut to display onscreen keyboard? How to create run box shortcut in windows 8.1? Windows 8.1 osk ease of access? Can I create desktop shortcut for Windows 8.1 onscreen keyboard? How to create a shortcut on the desktop for the onscreen keyboard in Windows 8.1? How to create a desktop shortcut in windows 8.1? How do i create shortcuts on desktop from software 8.1?